To tell you the truth I’ve been really confused lately with all the diets/ eating plans/ eating trends that seem to appear every other day like mushrooms after rain… So am I eating right? And the next thing I usually ask myself is what is right? I do eat more meat than I did while I was in Romania (where I mostly lived on cheese and tomatoes and basil) combined with lots and lots of cheese… which probably means I exagerate with proteins just because I got really scared of carbs. Until I figure out, what is what I made these italian meatballs for A. and he really enjoyed them with a generous side of spelt pasta. I just had a spicy tuna salad… recipe soon. Preheat oven at 370 F.
Cut the onion in half. Cut one of the pieces in half again, clean it/ wash it and chop it in really small pieces. Chop about 2 tbsp of italian parsley. Crush 2 garlic cloves and combine with the onion. Mix the ground beef with the egg, garlic and onion, parsley, pink salt & fresh ground pepper, basil and oregano. 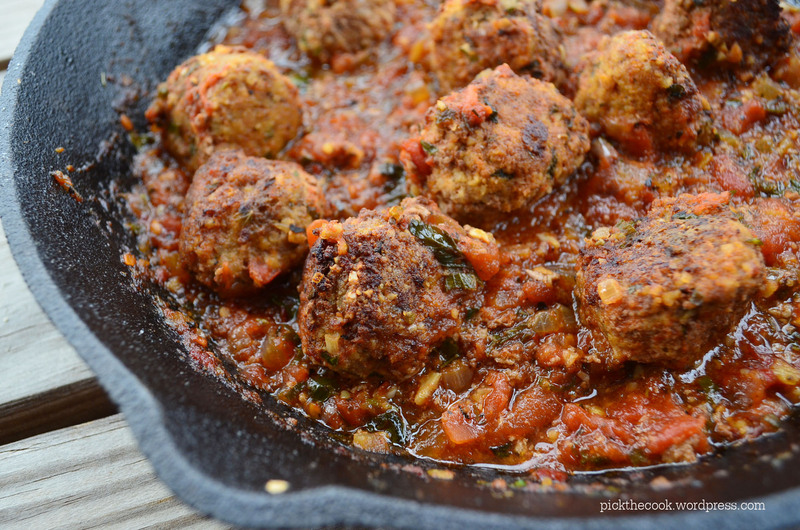 Form meatballs the size of a golf ball and roll them in almond flour. 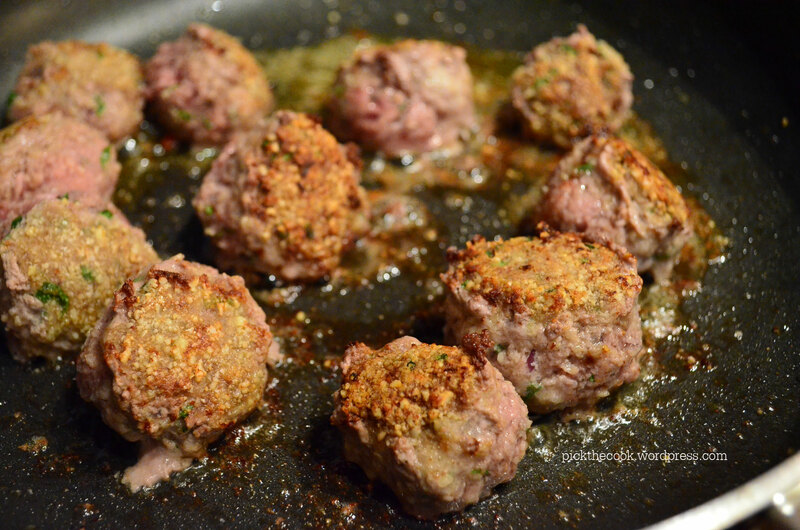 Heat a frying pan, add 1 tbsp olive oil and fry the meatballs until golden. While the meatballs are frying, chop the rest of the onion, crush the garlic, chop some parsley and cut the tomatoes in small pieces. Heat another pan (I used a cast iron pan; use an oven safe pan), add 1 tbsp olive oil and sauté the onion for 3-4 minutes. Add the garlic and the tomatoes. Season with pink salt & fresh ground pepper, parsley, basil and oregano. 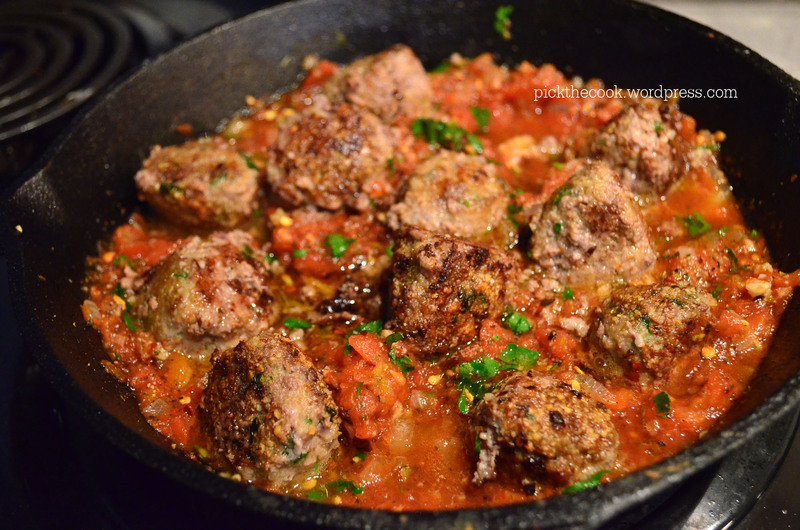 Add the meatballs into the tomatoe sauce and transfer pan from stove to oven. 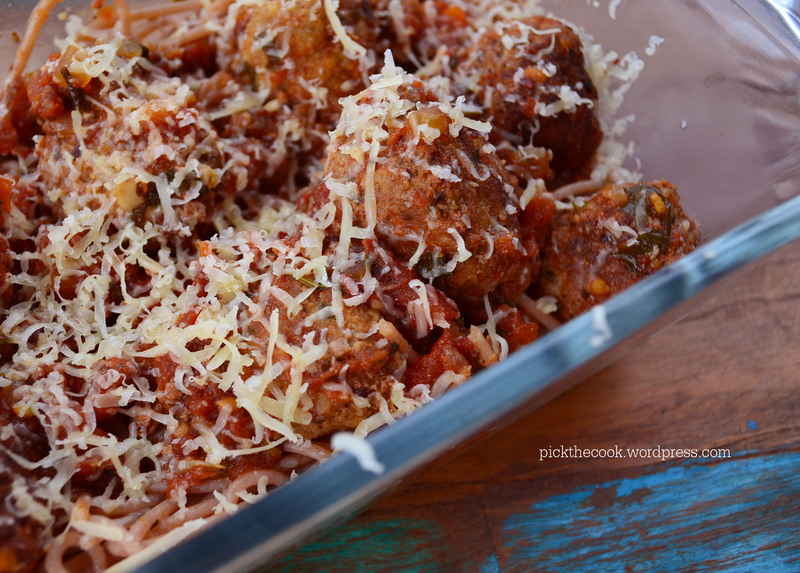 Let the meatballs cook for about 25- 30 minutes. Serve with parmesan over pasta or as side dish for mashed potatoes, broccoli or brussel sprouts.